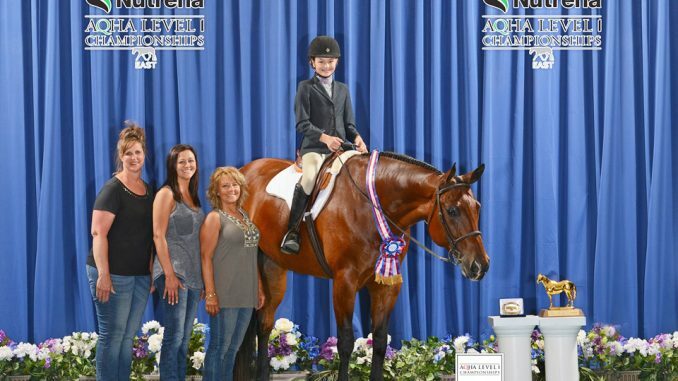 Peyton Baxter of Rockford, Michigan, earned the Champion Title in Novice 14-18 Hunter Under Saddle and the Halter Performance Geldings at the 2017 Nutrena East AQHA Level 1 Championship in Raleigh, North Carolina, on May 3rd 2017 . This Team also won The All Around for Level 1 in the 14-18 Division. Last year this team was recognized as a National Champion in The Rookie Hunt Seat Equitation. This team is also qualified for the 2017 AQHYA World Show in multiple events, which will be held in Oklahoma City, Oklahoma in August. Baxter showed the American Quarter Horse, Fightin Off Sleep, who is a 6 year old, Bay, Gelding owned by Ginger Baxter of Rockford, Mi. Fightin Off Sleep, sired by Too Sleepy to Zip and out of Form the Line Behind, was bred by Shelley Donovan of Sturgis, Mi. Baxter’s Trainer Mary Luther from Lowell, Mi is a long term trainer and Judge in the AQHA industry and is dedicated to continued growth of this team. The champion received a prize package that included a Montana Silversmiths belt buckle, gold trophy, neck wreath and a top-10 patch. The Level 1 Championships were designed to celebrate the accomplishments of Level 1 and Rookie riders and their American Quarter Horses in an environment that provides education and fun competition. More than 4,850 entries competed for top honors at the 2017 AQHA Level 1 Championships. The Farnam Central AQHA Level 1 Championships was April 11-15 in Oklahoma City; the AQHA West Level 1 Championships was held April 19-23 in Las Vegas; and the Nutrena East AQHA Level 1 Championships took place May 2-7 in Raleigh, North Carolina. 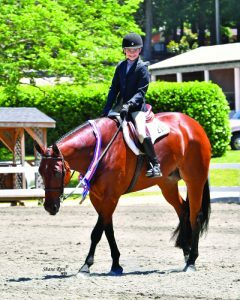 For full results and coverage from the Level 1 Championships, visit www.aqha.com/level1championships. Founded in 1940, the American Quarter Horse Association is the largest equine breed organization in the world. With headquarters in Amarillo, Texas, AQHA has a membership of more than 250,000 people in 86 countries and has registered more than 6 million horses in 95 countries.